Noam Wasserman is considered an authority on startups after having spent two decades researching founders and teaching and mentoring thousands of the students in this field. 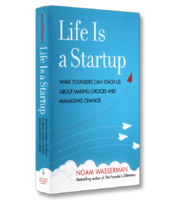 In Life Is a Startup, Wasserman applies his research on the methods of successful startup founders to everyday life. He offers important advice for envisioning change in our lives and managing changes to which we’ve already committed. Most business books approach the world of business as a self-contained artificial environment with its own rules and standard operating practices. Some books seek to educate by means of allegories and fables, but the majority promote those who succeed by going against those widely accepted rules and charting their own course. Noam Wasserman’s new book, Life Is a Startup: What Founders Can Teach Us About Making Choices and Managing Change, flips that convention on its head by presenting the argument that the lessons of business startups can be used to better manage change in our personal lives. Wasserman’s reputation as “the founder guy” was established with the 2012 publication of The Founder’s Dilemmas: Anticipating and Avoiding the Pitfalls That Can Sink a Startup. The development of a database of 20,000 entrepreneurs, combined with detailed interviews with hundreds of them, gave Wasserman a unique perspective on the challenges of managing change and communication in highly stressful environments. He attributes a pivotal insight to a conversation with one of his students at Harvard. That student used the techniques from Wasserman’s course to tackle a personal challenge in managing communication and conflict in his life, as he and his spouse struggled to make a significant life decision about career paths and geographic locations. The direct correlation between inflection points in a business startup and personal relationships was illuminating to Wasserman, and the idea for Life Is a Startup was born. Wasserman approaches these inflection points in two stages: the problem-framing stage, where you identify the issue and craft a plan to solve it, and the problem-solving stage, where that plan is implemented. Seeing a need for change may be a critical first step, but we can still face the same dichotomy as a business founder –– do you allow yourself to be “constrained by handcuffs” in your decision-making or, conversely, rush in too quickly because you are “blinded by passion”? You must also balance the fear of failure that can prevent you from envisioning change with a dismissive attitude towards the potential “perils of success” so that you don’t anticipate the new set of problems that success can bring. Wasserman describes the ultimate entrepreneur as someone who “combines the passion of the evangelist with the clear thinking of the analyst.” The strength of that combination lies in the ability to challenge your preconceived notions – your handcuffs – in your search for a new solution to a problem, while also realizing that the passion in your relationship will not fix any and all problems. In practical terms, this can mean pursuing a compromise rather than expecting one partner or the other to make a dramatic change. If one partner, for example, has a tendency to be spendthrift while the other is frugal, the solution is not to fight to prove the relative “rightness” of one approach over the other. Passion (love) will not fix this disparity. A plan of gradual adjustment, whereby the spendthrift commits to small, regular savings amounts that grow over time (as the frequency of shopping trips is gradually reduced) has a much higher potential for success. In the second stage, in which you implement your plan, Wasserman warns of a tendency to stick with existing mental patterns or “blueprints,” rather than embracing new ways to make choices. In addition, a common but misplaced commitment to equality can make the division of responsibility within a relationship almost impossible to achieve with mutual satisfaction. Life Is a Startup makes a compelling argument that applying an entrepreneurial mindset can help you to make important decisions at the key inflection points of your life. Whether it’s the next step in a relationship or a radical career move, Wasserman’s insights offer opportunities for reflection and action.